Phyllis was born in 1936 in Zion Missouri, 12 miles south of Fredericktown. She’s lived in Zion her whole life with the exception of a short time in St. Louis when she and her husband felt like fish out of water. She was born at home and had an older brother and an older sister. Her childhood school was in a 2 room brick building with no electricity but thanks to close proximity to the Mississippi River Fuel Transmission (Now Center-point Energy) running water was available. Phyllis describes what it was like to be in a 1 room, then 2 room school with various grades in the same room. The school had a beautiful library full of books which Phyllis enjoyed because she loved reading books. She and all of her cousins, 17 first cousins, went to the school together. There were 60 students in the school, 1 teacher. Eventually a second room was added and the upper grades were moved into that room. Phyllis feels that a mixed grade school room helped the younger students advance more quickly as they were exposed to higher level teachings. She tested at the top of her class and her fellow classmates did as well. When the weather was nice they would be driven part of the way by her dad to the grandparents then walk the rest of the way. When the weather was bad her dad would take her and cousins all the way to school. Her favorite topics were English and Home Economics. She did not enjoy history which she regrets as she loves it now. Phyllis discusses the High School in Fredericktown. The Marvin College building was the auditorium with a Vo/Ag and Home Economics departments under it. There was a granite building that was the gymnasium. Activities such as plays were in the auditorium or gymnasium. Her dad went to college at Marvin when it was a college. She graduated from the Fredericktown High School and went to Mineral Area College for awhile. The Depression did not seem to impact them as much because everyone in the family and community had farms with large gardens, fruit orchards and livestock. They had more food than they needed. There was a small store in Zion but no trading or bartering that she remembers. Her father also sold eggs in a store in Fredericktown, Kinders Store which was in Northtown. He also raised livestock during WWII. Particularly he raised and trained mules for the government. Her aunt saved the feed bags that came in a nice, soft cotton material and her mother would by them for 25 cents each to make dresses based on pictures in Montgomery Ward catalogs. Not everyone had vehicles. Her dad had a truck though and on Saturdays they would go to the creek and clean the truck so that on Sundays he could pick people up and give them a ride to the church, 12 Mile Baptist Church in Zion which is still in use. During the winters the family and community would gather in homes to quilt. Living without modern amenities was just a fact of life. For example, there was no air conditioning. They swam in the creek, slept on the porch and avoided being upstairs during the heat of the day. No electricity until she was 12 so no fans either. Polio and other childhood diseases such as measles, etc. She had measles 3 times, “big” measles, “little” measles, “red” measles. Their doctor was in Fredericktown but on occasion a closer doctor would visit the home for some emergencies. That doctor once tended her when she had double pneumonia when she was five. The hospital didn’t open until the 1960s, home births were common. When she initially began attending MAC she wanted to become a librarian. The married young at 19 and then had children. She didn’t begin working outside the home until her youngest was 4 years old. Her work outside the home began with Brown Shoe in the office and then at a Fredericktown loan company. She took a break to help take care of her first grandchild and then went back to work, this time at SMTS “part-time” but as it turned out it was full-time, often more than full time because the company was growing quickly. She retired from there after 30 years. Built the home they still live in and their girls married and they became grandparents, then great grandparents and now great great grandparents. Favorite stores in Fredericktown included fabric stores such as Figlers. 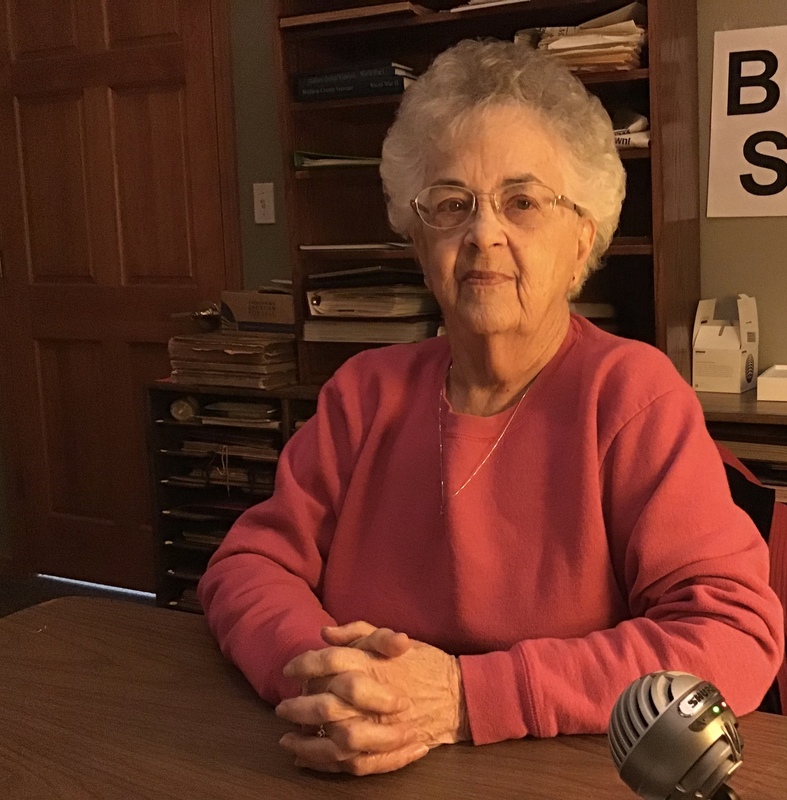 Phyllis recalls some of the businesses that were in town: Lawyers, Snap, Gramn, and Reed, Hills Sporting Goods,Economy Sales which was a liquor store, the only place in town that carried Bibles which could be the source of some embarrassment. Other stores included Jones Brothers, P & Hirsh, Federated, Blair’s, Schwanners, Tom’s Shoes, Lumber Company, Schultes, Jones Brothers, Western Auto, Dicus Drug store that also had a lunch counter, Huff’s Cafe, Wards and Kroger. She mentioned how the stores came and went. The slow-down of the town after the mines were closed. Important community groups and traditions are mentioned. She was a member of the 4H. She mentioned the importance of church. Every June her grandparents celebrated their wedding anniversary and the family held a large gathering, usually of a hundred or so, which included the church congregation, family and community. One of their favorite past times was just playing in barns. They would climb up into the hay lofts and play house and school. Spiders and snakes! She was always creeped out by both. She tells the story of her cousin throwing a dead snake which hit Phyllis on the neck and. Phyllis fainted. Local community celebrations such as the county fair are discussed. She mentions attending the county fair and she’d often be stuck with her dad while her mom took the two younger siblings. Her dad was a business man and often stopped to talk to people so she spent that day mostly listening to adult conversations and never getting to the fun stuff. Her mother was very creative and good at turning everyday things to their advantage. For example she would gather hail after hail storms and use that to make ice cream since both ice and ice cream were hard to come by. Her mom was an orphan, raised by her aunt and uncle. 3-4 times a year they would visit family in Bell City. When those cousins visited Zion it was usually a big event for the family. She remembers taking them down to the barn and showing them around the play places and horses. She recalls the simplicity of those times and how kids played with fewer toys and how they would often improvise. She recalls being baptized in a spring fed creek in November. There were 15 or so to be baptized and she was the first so she had to stand, wet and in the cold while all the others were baptized after her. Her mom had brought blankets though and did her best to wrap her up and keep her warm. Phyllis recalls how her grandparents came to be in the area. Her Grandfather was Ben Whitener and his brother was Lawson that they called Poley, and another brother, John Henry that owned a department store in this area at some point. Her Grandmother was a Cloninger, her mother was a Graham, they’d all come from South Carolina. She recalls a Fredericktown photo calendar from years ago that had a photo of one of John Henry’s delivery wagons in it. They came in the mid 1800’s and had a Federal Land Grant. She’s not sure why they chose this area to settle in.